warrior, berserker, healer, and druid. A member of the oldest races of Serin and with one of the richest heritages of all, the dwarves are present in many parts of the realms. The present day dwarves live around fords and forests, travelling to towns to trade, and are respected by societies for their generally law-abiding nature. Only the more adventurous dwarves are found following a different ethos, these particular dwarves not usually being a part of society. Tending towards the alignment of good, these ale-loving creatures remain rather prone to greed and hoarding from their heritage's rich history with gems and artifacts. Their fond obessesion for metals and ores can from time to time strain the way they get along with the other races. Dwarves are typically stead-fast and easy to anger, but usually tend to jest about things. Despite being allies with the elves, they consider them fickle and flighty, misguided by their overperceived sense of wisdom. They do however have a strong sense of humour. Typically ranging from a height of four to four-and-a-half feet tall, dwarves are so heavily built that they still weigh as much as a man before wearing armor, and this stocky physique makes them poor swimmers, with a dislike for water. It is no surprise then that the enterprising humans often use rivers as a trade route when dealing with the dwarves. In battle a dwarf is a brave and courageous fighter, willing to fight for a cause worth dying for, but remains cautious and understanding of the importance of tactical retreat. It is this knowledge of warfare that has granted dwarves the potential to beat even giants many times their size on the battlefield. They are particularly good at resisting the effects of magical spells. Dwarves are cousins of the duergars, dark-dwarves that live deep underground, the history of this relation being one they would rather not talk about. Dwarf berserker - Final Reserve. 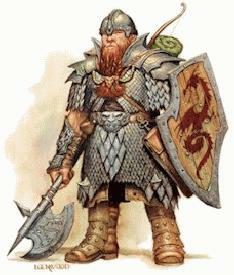 Dwarves can afford to wear less save equipment because of their magic resistance. Because of their comparativly low dexterity, dwarves may find themselves being tripped often during combat.